My friend Susan recently introduced me to these tasty delights. I seriously LOVE them!!! They are so good and pretty easy to make. Smash up the Oreos. If you have a food processor I would recommend using it for this job. I don't so I put the cookies in a ziploc and used a rolling pin. I then transferred them to a bowl and finished the job with a hand mixer. After the Oreo's are as crumbled as you can get them, mix in the cream cheese. Roll the mixture into balls and freeze for at least 3 hours. After they are nice and frozen, dip in the white chocolate. Enjoy! Oh my...I am going to have to try these divine treats! Serious diet crashers! Those sound YUMMY!!! Oh my!!! Can't wait to try them. 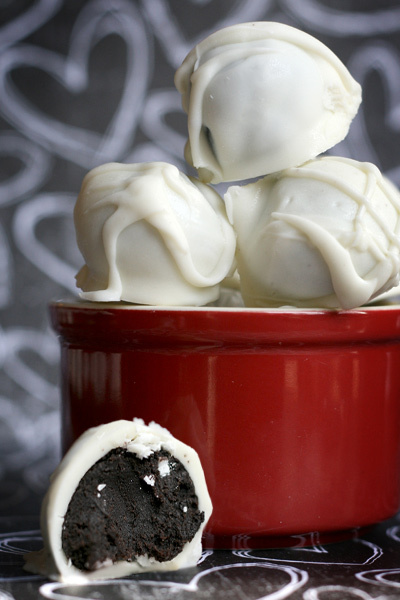 Love the mint oreo idea from Melissa. Oh I am making these asap! Now that we have made delicious "edgeful" brownies, this is definitely the next treat on our list! why oh why did you have to share this!!!??? sounds to me like you need to have us over and make these. :) oh and mint...mmmm...my fav! !